Here is a fascinating and unusual addition to the acclaimed Classics of Western Spirituality™series. Abraham Miguel Cardozo (1627-1706) was born to a Marrano family in Spain and raised as a Catholic. After fleeing Spain at age 22, he returned to Judaism and educated himself in rabbinics and Kabbalah. A physician by trade, Cardozo became a believer in the self-proclaimed Messiah Sabbatai Zevi. In later years he thought himself a truer Messiah, one who would redeem the Jewish people and the entire world. A subtle and lucid theologian, Cardozo combined rabbinic learning, his Catholic training and a budding awareness of Eastern religions into a remarkable theory of comparative religion that he set forth in his treatise, This Is My God and I Will Praise Him, which appears in its entirety here. Included as well are slightly abridged texts of his apology for Sabbatai Zevi's apostasy (Epistle to the Judges of Izmir), and his lengthy autobiographical letter written near the end of his life, and the magical and messianic portions of his treatise Israel, Holiness to the Lord. An introduction provides rich background information on Cardozo's life and travels, and the meaning and context of his writings. 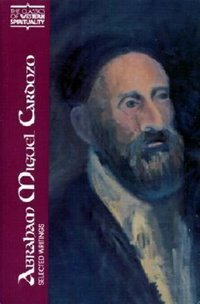 Never before translated into English, or any language, Cardozo will hold great appeal for persons interested in Judaism, mysticism and early modern history, as well as for spiritual seekers, particularly those looking for some unorthodox variant of their current tradition.